I am pleased to announce that I have been invited to give a lecture at USC's 2010 BIM Conference: BIM Analytics. 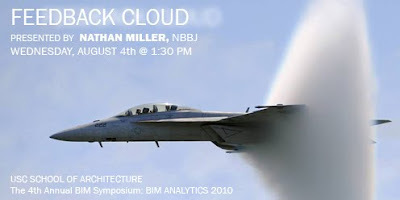 My lecture is tentatively titled: Feedback Cloud: Tactics for Toolset Integration and Design Optimization. The talk will outline the digital processes used on some recent NBBJ projects as well describe a few experiments for creating performance-driven design solutions in a team made up of diverse participants using a multitude of tools. 1. Embraces technological difference within a team. 2. Provides an adaptive framework for design change and variation. 3. Links together design and analysis for a performance-driven process. My talk is tentatively scheduled on Wednesday, August 4th @ 1:30-2:00. The conference is free, however you will need to RSVP here. Darren Roos, Suffolk Construction Company, Inc.